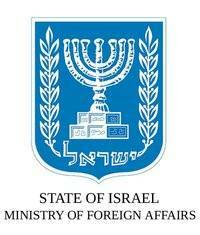 Israel’s empty Foreign Ministry represents Israel fairly well. When it became clear last December that he was about to be indicted on corruption charges, Avigdor Leiberman resigned as Israel’s Foreign Minister. 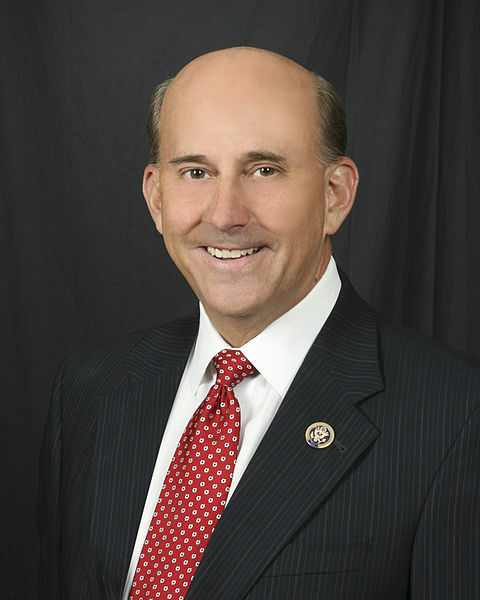 He did not quite resign from wielding influence, however. Indeed, having since held elections and formed a new government, Prime Minister Netanyahu is essentially retaining the Foreign Ministry for its former occupant, at least until the trial is completed; Lieberman himself is expected to testify in two weeks. In the meantime, the Foreign Ministry essentially stands bereft. We will try to apply sovereignty over the maximum [of the West Bank] that we can at any given moment. It will take time to change people’s awareness but in the end this will penetrate. And then, what seems today like a fairy tale will eventually become political reality, and the reality on the ground. So the Foreign Ministry does have the anti-democratic, fairy tale guy (who, coincidentally, doesn’t speak English) at its disposal; Elkin met with the Foreign Minister of Azerbaijan just the other day. this scandalous situation has already drawn expressions of displeasure from world leaders. Not only that—it has led a European foreign minister, a known friend of Israel, to cancel his visit. So Israel also has the Foreign Affairs-Lite guy, who no one really wants to see (the diplomat who went so far as to actually cancel was Belgium’s Foreign Minister). The Samaria (Shomron) Regional Authority [local council of the northern West Bank settlements] has even established its own quasi-“foreign ministry,” which circumvents the official one. The Authority carries out its own independent contacts with foreign diplomats, and brings some of them to Samaria for tours. Finally, Netanyahu is officially the acting Foreign Minister, but he’s too busy to be involved with much beyond visits from the likes of Hagel, Kerry, and Obama (hence the Belgian snub), and maybe-possibly sorting out the mess with Turkey at Obama’s behest. But while reasonable people might reasonably describe this situation as “scandalous,” it is also strangely appropriate. The Real Foreign Minister awaits trial and expects his country to await him, consequences be damned; his deputy doesn’t like freedom of speech and can’t speak English; the country’s Shadow-and-Wannabe-Foreign-Minister is working out of what amounts to a makeshift office and annoying people in the process; the settlers are disregarding the government entirely; and Netanyahu is pretty much focused on keeping the US government on his side (a goal he once said is an easy one to achieve). This in a country which has in recent years seen a former Prime Minister, a President, a Justice Minister, and a collection of other government officials indicted and/or convicted for various kinds of malfeasance; a country run by people who have often seemed exceptionally tone-deaf to English-speaking supporters and exceptionally eager to stifle democracy; a country led by a government that continuously irritates and annoys its closest allies (also seemingly on purpose), its political scene wholly dominated by the settler movement and headed by a Prime Minister who says he wants better relations with his country’s nearest neighbors but doesn’t actually do much to achieve that end. This might not be the image that Israel wants to project. It might not reflect what I love about Israel. But the current state of Israel’s foreign affairs is pretty representative of the Jewish State circa 2013, whether any of us likes it or not. And that’s the Israel with which the rest of the world actually has to do business. Gone fishin’! Left you a humorous video! My mother and I are about to leave on a trip that I’ve been planning (possibly only in my mind, because she doesn’t remember me talking about it) since high school. We’re off to Scotland! What this means for the blog and my Twitter account is either total silence, or maybe near-silence. I can’t really imagine what I might feel a desperate need to write about while I’m away, but knowing me, there may just be something! Tomorrow you’ll see the crosspost of my latest Open Zion piece (about the laughable/sob-inducing state of affairs at Israel’s Foreign Ministry. Wheee! ), and we should be back to our regularly scheduled programming on May 6. As I take my leave, please enjoy the following, and have pity on two poor American women who will no doubt find themselves struggling through the morass of another nation’s English. Senior Netanyahu adviser admits Fayyad was a partner for peace. As anyone who has spent any time observing the Israeli-Palestinian conflict can tell you, it’s pretty much Gospel among Israeli government types that “there’s no partner for peace” on the Palestinian side. Oh, alas and alack (goes the argument), if only we could make peace with the Palestinians! Everyone knows that no one wants peace more than we—but there is no partner! Etc, and so on. There’s a word for this. It’s a Yiddish word, a word that has crossed oceans and land masses and worked its way into the languages of many peoples, and that word is chutzpah. 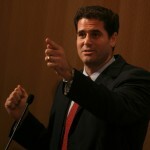 Dermer’s chutzpah takes a variety of forms, not least that special kind required for an American-Israeli Jew to pass judgment on all Palestinian leaders in the last century and find precisely one with a heart for his or her own people. That’s some ding-dang chutzpah, right there. One is tempted to ask just how many Palestinian leaders Dermer has met, how much of their work he’s read, how many times he’s polled the Palestinian people about how they, in turn, feel about their leaders. And who is a leader, by Dermer’s lights? Are we talking Haj Amin al-Husseini, Aziz Shehadeh, Hanan Ashrawi, Sari Nusseibeh…? And yet (with all due respect to Dermer’s disrespect for the people that Israel occupies) the largest, most significant slice of Dermer’s chutzpah pie is the one salted with crocodile tears over Prime Minister Salam Fayyad’s resignation. Or, I don’t know, maybe the metaphorical tears are real. Maybe Ron Dermer is genuinely worried about the resignation of a Palestinian leader who was routinely sabotaged and undermined by the very government that Dermer has advised, supported, and defended. It’s entirely possible that Dermer truly believes that this doesn’t bode well for Israel’s future. Oh was he, Ron? Was he really now? Did you urge your good friend Bibi to actually do anything to support the Palestinian Prime Minister’s peace partnership? To reward him for it, so that Fayyad would have something to show his people, so that they would want to continue to see him at the helm of their government? Anything? Anything at all? (And please note: All answers that contain the words “settlement freeze” will be disqualified as being equal parts smoke and mirrors). To this American-Israeli, it seems pretty clear that Salam Fayyad was the one in search of a peace partner all these years, and that neither Bibi, nor his brain, were very much inclined to cooperate. 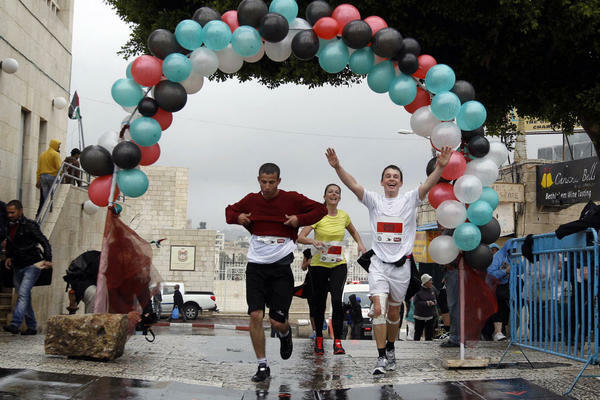 Bethlehem Marathon can’t find 26.2 miles of contiguous land. What does military occupation look like? It looks like a lot of things. In the case of Israel’s occupation of Palestinian lands, it looks like Israeli soldiers in full riot gear using a handcuffed Palestinian as a human shield; it looks like armed incursions into Ramallah, the seat of Palestinian government; it looks like the arrest and imprisonment of children (for instance, an 8 year old arrested by Israeli soldiers while playing with his cousin). Writers need to learn to write differently about terrorists who happen to be Muslim. How to pray as a Muslim. The first thing I read on the morning after the capture of Dzhokhar Tsarnaev was a well-written, well-constructed, and very informative piece about Chechnya, Chechens, and the Tsarnaev brothers written by David Remnick (a hell of a writer) in The New Yorker (a hell of a publication). Yet in the midst of all this quality, Remnick fell into a particularly pedestrian, non-quality trap: He used simplistic conventional wisdom as shorthand, and in so doing, conflated (whether intentionally or not) two very different things that simply are not conflatable. The Caucasus region is multicultural in the extreme, but the predominant religion in the north is Islam…. In 1991, nationalist rebels fought two horrific wars with the Russian Army for Chechen independence. In the end, the rebel groups were either decimated or came over to the Russian side. But rebellion persists, in Chechnya and in the surrounding regions—Dagestan and Ingushetia—and it is now fundamentalist in character. The slogan is “global jihad.” The tactics are kidnappings, assassinations, bombings. …Members of the [Tsarnaev] family occasionally attended a mosque on Prospect Street in Cambridge, but there seemed nothing fundamentalist about their outlook. …[Tamerlan, the older brother,] described himself as “very religious”; he didn’t smoke or drink…. Three years ago, he was arrested for domestic assault and battery. But when you’re writing in a society which everywhere makes just that assumption; a society in which the faith, Scripture, habits, and even clothing choices of Muslims are frequently treated as signs of a violent pathology, you must be particularly careful not to further a conventional wisdom that is not only wildly inaccurate, but physically dangerous to Muslims. Remnick doesn’t need to write “the more religious a Muslim is, the more likely that Muslim is to engage in extremist behavior” — far too many of his readers will make the leap on their own. “Some radical view that twisted things in the Koran” – nine short words that open a door to the possibility that in order to descend into pathological violence, a Muslim must, in fact, twist the Qur’an, twist his or her faith, leave actual Islam behind and create something awful and new onto which he or she slaps the word “Islam” — just as the KKK, and Westboro, and Scott Roeder call themselves Christians; just as Yigal Amir, and Baruch Goldstein, and the West Bank’s Od Yosef Hai Yeshiva call themselves Jews. Tamerlan’s YouTube channel features a series of videos in support of fundamentalism and violent jihad… [one] provides a dramatization of the Armageddon prophecy of the Black Banners of Khurasan, an all-powerful Islamic military force that will rise up from Central Asia and defeat the infidels; it is a martial-religious prophecy favored by Al Qaeda. Writers use shorthand all the time, often in order to create space to tell a complicated and complex story. In 21st century America, “he started to pray more frequently” is often shorthand for “this was a Muslim about to descend into pathological violence” — but when we use that shorthand, we are, in fact, denying the complexity of the very story we’re telling. We can no longer write this way. If our goal is to tell the truth, we can’t let dangerous inaccuracies fill the spaces between our words. We have to seek out sources who can help us clarify to readers that what terrorists call “Islam” is not accepted as such by the vast majority of the faithful; that increased devotion is almost never a sign of hatred but rather a sign of love of God; that 99.999% of Muslims who pray five times a day would no sooner launch a terrorist attack than would 99.999% of faithful Christians or Jews. That terrorists who happen to be Muslim represent not Muslims, but pathology. Remnick serves as my example here, but as anyone who has spent any time reading about the events at the Boston Marathon can attest, he is far, far from the only writer who has fallen into this trap. The story of terrorism, and fear, and those who would harm innocent people, and the innocent people they harm is far too important a story for us to get wrong by means of shortcuts. We need to write better. Cat. In a shark costume. On a roomba. Chasing a duckling. My source was Nick Harkaway, who retweeted Rick Lipman, who retweeted Susan Arendt. I wish I knew who made the actual gif, because I’d like to buy him/her an enormous chocolate cake.